A few posts ago I talked about the new "modeless sandbox" user interface. It was nice because it didn't require the player to manually switch modes between building ships and playing the game. Unfortunately, as I pointed out at the time, having on the screen at the same time the full U.I. for everything you might want to do made the screen feel quite crowded, and it has become apparent to me that, unless I reorganize the user interface for the sandbox, it will only continue to become more and more crowded. What I'm presenting here is what I think is a visually clean, usable compromise between not having modes and not having everything on the screen at once. But the new mode interface is different from the old mode interface in presentation, organization, and efficiency. I steal shamelessly from games like Sim City and software like Photoshop that organize tools into a handful of high-level categories and then show the individual tools in the category once the player opens the category. So in a sense, these new modes feel just like tools in Sim City or photoshop. And this re-categorization really allowed me to minimize the amount of U.I. on the screen during normal play, which keeps the game from feeling claustrophobic. In the screenshot below there are four buttons stacked vertically on the left, each activating a single "category" or "mode". The first button, highlighted below, is the default mode. It's called the Command Tool, but it serves exactly the same purpose as the Play mode did previously -- when selected, you can click on and command ships like normal. As the default tool, clicking the right mouse button while using any other tool will return you to the command tool. This is an important feature borrowed from the modeless sandbox version, because it eliminates half the nuisance of switching modes. 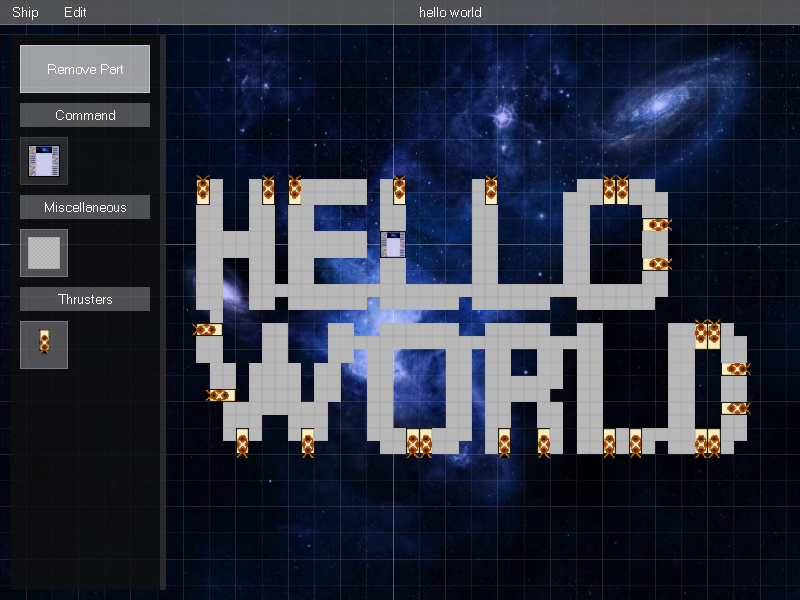 In this next screenshot, the Build Tool is selected. While selected, a sub-menu is displayed from which the specific desired part can be selected. While the Build Tool is selected, it works just like the old Build mode from the original sandbox U.I. Here I show a brand new tool, the Ships Tool. 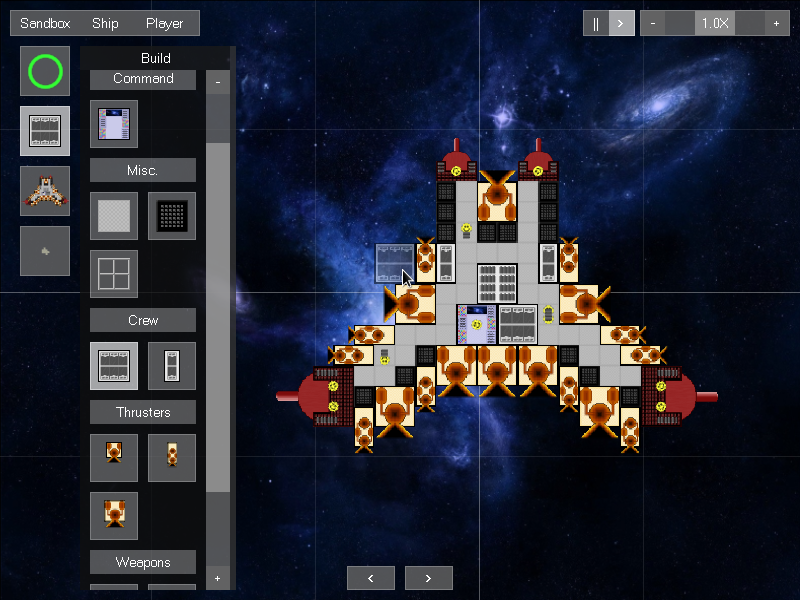 In prior versions of the sandbox, if you wanted to add a previously-designed ship into the sandbox, you had to open the Ship menu, click the Load button, and then select the ship from a dialog. In this new version, all of the previously-saved ships are put into the Ships Tool. Simply select the Ships Tool, select the ship you want to add, and click where you want it to go. And lastly we have the Doodads Tool. Right now the only objects it contains are the asteroids, but eventually it could contain other objects such as worm holes, salvageable resources, or gas fields. Adding multiplayer play to StarWright has been a huge task, as anyone who has ever added multiplayer networking to a previously-singleplayer game can tell you. 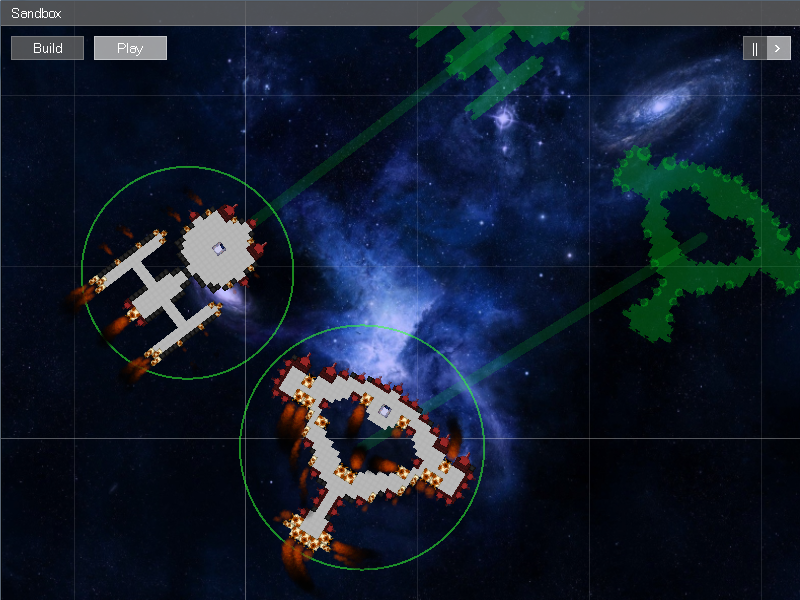 Every core mechanic of the game, from damage and destruction to crew pathfinding to command and control, had to be overhauled to be multiplayer-capable. Add to this the creation of a custom UDP communications protocol and a programming library for "remote procedure call", both of which are critical to the multiplayer capabilities of StarWright. To make matters even more difficult, my belief is that ever single mode of play in StarWright should be multiplayer-capable. That even includes the sandbox mode, which is the only real way to play the game right now. Making the sandbox multiplayer-capable as well meant that all the systems related to designing ships, such as adding and removing ships, adding and removing parts, and undo/redo, had to work over the network as well. Oh yeah, I also want other players to be able to drop in and out of the game whenever they want. No pre-game lobbies, except for certain kinds of competitive matches. The host just starts a game, checks a box allowing other players to join, and then other players can hop right in. This means that the host computer must be able to send the entire current state of the game whenever a new player joins, which is its own big system unto itself. On the bright side, sending the state of the game to another player essentially amounts to creating a save file of the game and sending it to the other player. So even though drop-in-anytime was a big feature to implement, I basically got a save-game feature almost for free. The code that handles networked state sending is about 95% shared with the code that handles game saving, even though networked state sending and game saving write the data to different formats (networked state sending uses a compact binary format to reduce bandwidth usage, while game saving uses a custom text format which is more tolerant of game version changes). This is thanks to a robust multi-format serialization library that I developed for my game engine, Halfling. Starships blowing themselves up in slow motion is pretty cool. Starships now have crew on board. 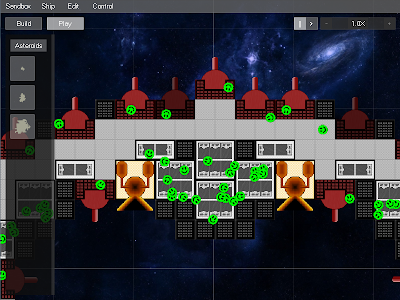 As in the most recent version of the original prototype, the crew on a ship are fully automated. Crew currently only have one job, which is to staff the ship's weapons and control room. In the future they will also have other tasks to perform, such as delivering ammunition and making repairs. In order for a ship to have crew, you need to provide living quarters for them. In the current version of the game, there are two such rooms: A small "bunk" which provides space for 2 crew, and a larger "quarters" which provides space for 6 crew. 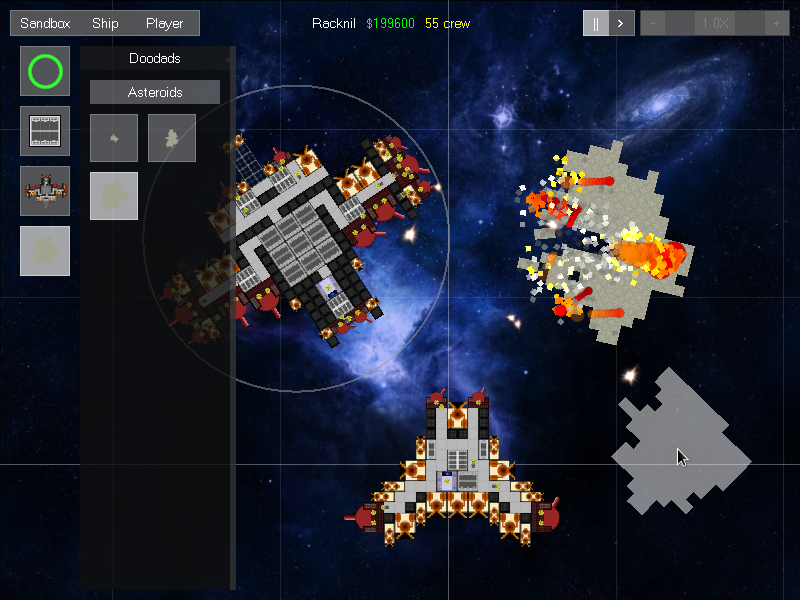 I'm in the middle of adding a crew simulation to the game, but I took a break to add asteroids to the existing game. Asteroids aren't very useful except for target practice. 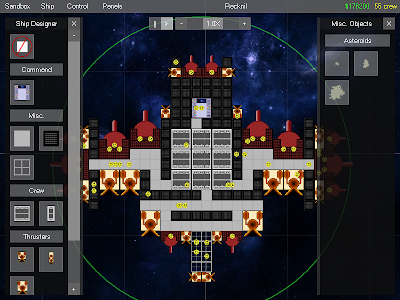 When in Play mode, the toolbox on the left, which ordinarily shows the ship parts available, now shows a few different sizes of asteroids that can be placed into the sandbox. Each asteroid has a randomly-generated shape. When programming video games, it's very important to understand how much time your computer's processor is spending in various parts of the game's code. In order to better understand StarWright's code, I added a CPU profiler to my game engine to display graphically how much time is being spent in each section of code. Each row of text represents a single section of code that is being measured. A section of code may also have a number of "sub-sections", which are indented in the above picture. The colored bars indicate the "slices" of the game frame that are spent in each code section. You can think of the left edge of the profiler as representing the beginning of the frame, the right edge as representing the end of the frame, and the colored bars as representing the time within the frame that is spent on a specific task. 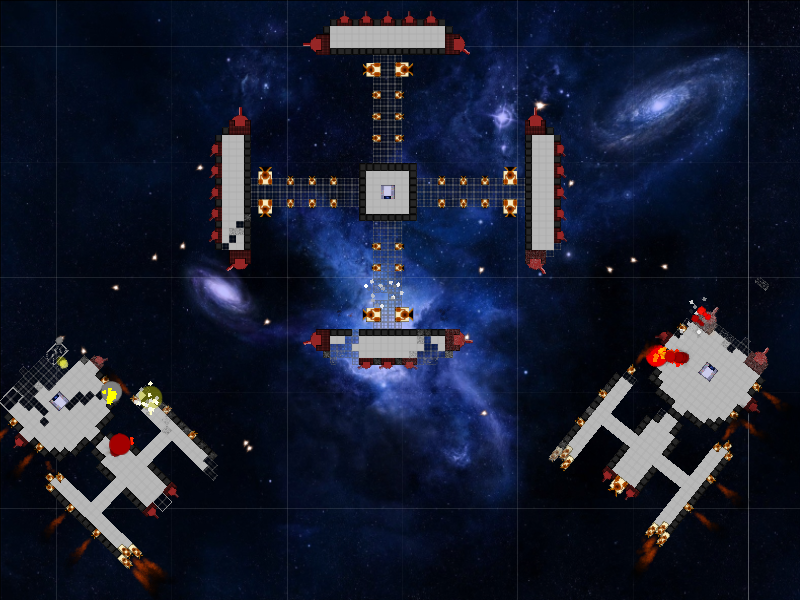 Combat is of course a major part of StarWright, and I've just finished the major ship-versus-ship combat systems. The mechanics of combat work essentially the same as in the original prototype. 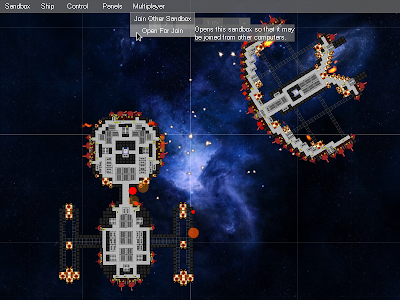 Weapon turrets automatically track and fire upon nearby enemy ships. Damaged is handled on a part-by-part or room-by-room basis, where individual parts or rooms can be individually destroyed. Additionally, if the only parts joining two sections of the ship are destroyed, then the ship will be split in two and become effectively two distinct ships. The original Starship Builder prototype suffered from some terrible user interface choices. It's not that they were stupid, but that they were a product of tacking on lots of features and not being sure about how I wanted the game to play. Now that I have a better sense of what the game will be, I can greatly improve the user interface. This past week I've been working on the in-game controls for commanding ships. Since I see no need to reinvent the wheel, I've modeled the controls after typical real-time strategy games like StarCraft and, especially, Company of Heroes. Like most RTS games, you can left-click on a ship you own to select it, or drag a box around several ships to select all of them. When you have ships selected, you can right-click somewhere in empty space to order your ships to move there. I've stolen a feature from Company of Heroes, whereby if you right-click and drag you can easily reorient which way your ships are pointing. 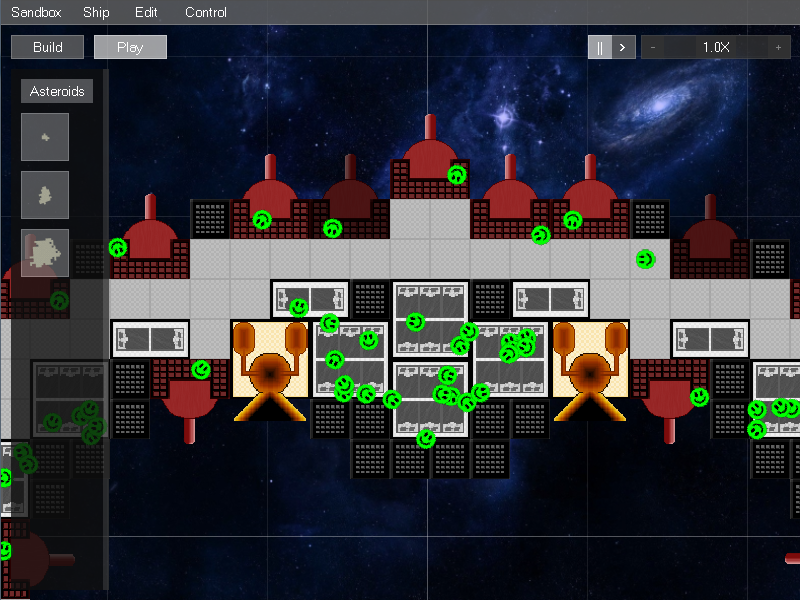 The green circle in this screenshot indicates that the starship is selected. The green "ghost" indicates the destination to which the ship has been commanded. The thick green line indicates the path from the ship to its destination. 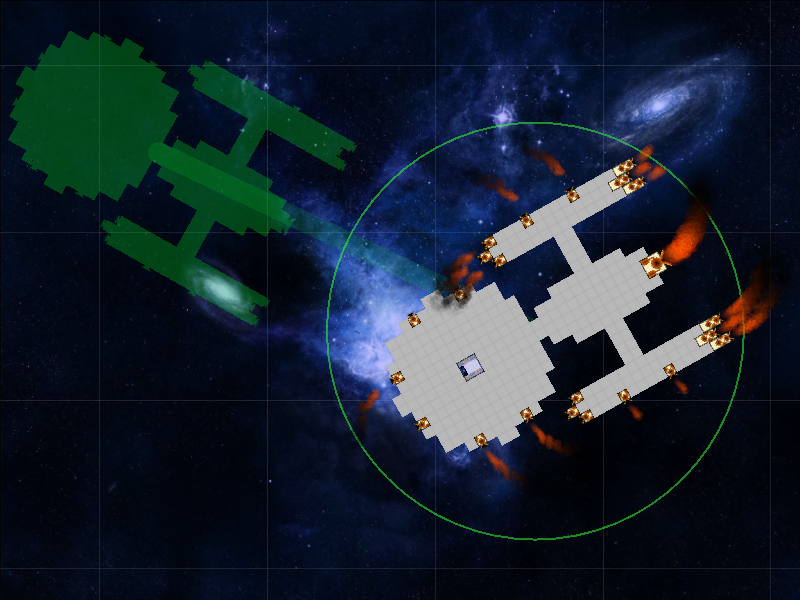 As in the original prototype, once you have commanded a ship to move to a location, an algorithm will determine the optimal "activation level" for each thruster on your ship. This algorithm I was able to lift virtually unchanged from the original prototype. 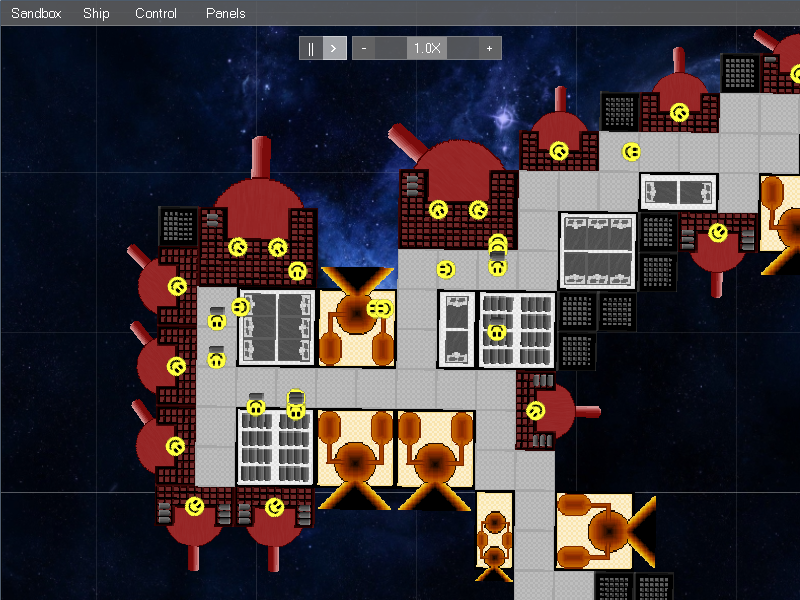 If you download the file to your computer -- and of course have the latest version of StarWright -- you can simply load that PNG straight into the game and it will be fully playable and customizable. 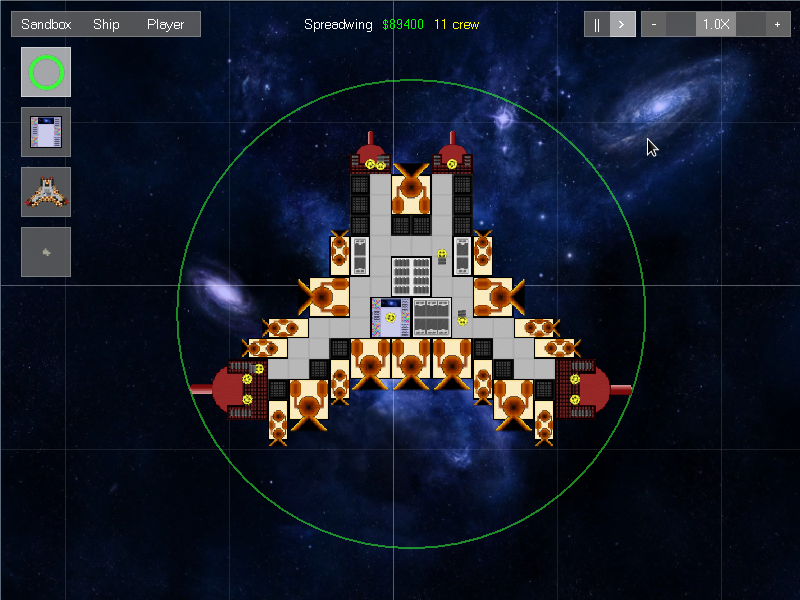 I'm hoping this will make ships easier and more fun to share, and it has the added bonus that I don't need to generate an in-game preview of the ship. There's no fancy image-analysis going on. I'm simply embedding the ship data into the least significant bit of each of the red, green, and blue color channels of each pixel in the PNG (which is 32bpp ARGB). That's 3 bits per pixel, which means a 512x512 image can store about 98KB of data, which is more than enough for the largest ship I currently allow. Since only 1 very-insignificant bit is used per color channel, it's very difficult to see any visual difference. This is a kind of "Steganography" (hiding one message inside another), and Spore and the upcoming game Monaco use the same technique for creatures and custom levels. Save the ship layout to a proprietary data format. Compress the data using GZIP. Since the data is highly repetitive, I get about a 20:1 compression ratio. Take a 512x512 screenshot of the ship at 32bpp. Embed the compressed data into the least significant red, green, and blue bit of each pixel in the screenshot. I could use the alpha channel as well but that'd probably be more visually noticeable. Save files are much larger than plain compressed text files. But the largest ship I have is still only 116KB on disk. Any alterations to the PNG file will almost certainly corrupt the embedded data. 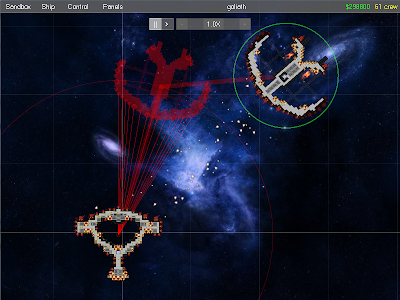 Theoretically the ship data may not fit in the image, but I can always increase the image size or use more bits per pixel. At first I was using 1024x1024 at 6bpp which was way more than I needed. Supposedly embedding already-compressed data inside a PNG will reduce the PNG compression, but I've seen virtually no file size increase vs screenshots without embedded data. Well, I'm starting over from scratch. 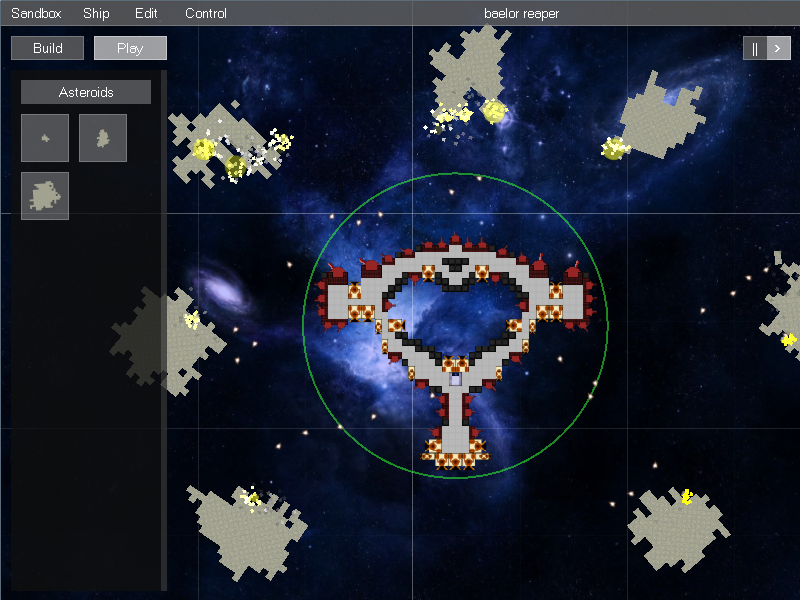 For a while now I've been working on a game prototype called Starship Builder. In short, it's a "build-your-own starship simulator" in which players design their own starships by placing rooms and parts onto a grid. Players can challenge other players in multiplayer matches to see who can design the best starship. 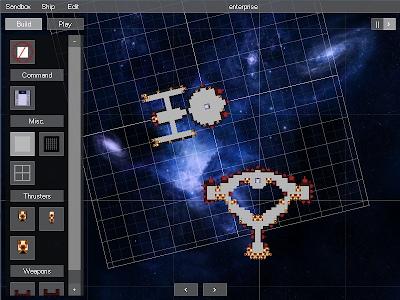 Eventually, players will be able to explore galaxies with the starships that they create. You can read more about the game on my website. I think that the existing prototype shows a lot of promise (usually when I show it to fellow gamers, the response I get is, "When can I buy this?"). But as high as its cool-factor is, the prototype as it exists right now is deeply flawed, both in terms of design (the user interface is very confusing and too detail-oriented) and programming (the game is being held back by choice of game engine). So I'm starting over. For now, I'm calling this new version StarWright. Beginning again from the ground will help me hit reset on the game's design. I will take what I learned from the prototype (the premise is fun and interesting, but the U.I. is terrible, micromanagement is tedious, and player-control of multiple ships is desirable) and build a much more fun game that is much easier to play. But probably more importantly, starting over afresh will let me correct some major technical issues with the current prototype, most of which stem from the use of the Unity3D game engine. While Unity was I think a good choice for proving out the basic concepts of the game, it has proven to be unable to scale up to the complexity that the game demands. Unity requires that ever piece of code be attached to a game object, and it does not provide control over the main game loop or the precise order in which objects are updated or rendered. Working around those limitations was cumbersome, inefficient, and a lot of work. By switching to my own game engine (dubbed Halfling, it was originally created to power my games Tetrik and Tanky-Tank), I now have full control over the game's code, which will allow me to make a more sophisticated and much more optimized game. 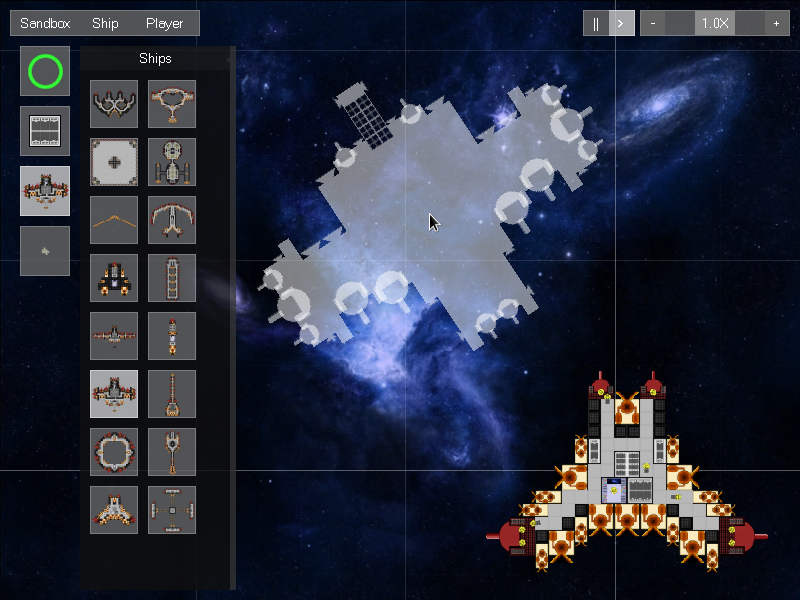 There's not much to the game yet -- only three parts you can use, and no way to test your ship, fly around, or fight other ships. But I have high hopes for this new version. Throwing off the shackles of the old design and game engine already feels like breathing in a cool breeze atop a mountain. It's liberating. Now that I'm taking the project more seriously and hope to sell a finished game one day, I probably won't be posting regular playable builds of the game -- just screenshots and maybe an occasional video. That will also save me the hassle of having to make a new build for every blog post I make!